Most nights I can sit at the dinner table, close my eyes and instantly be transported to a fairy tale. Oh! I hear you exclaim with envy, ‘SHE HAS THE PERFECT LIFE!’. But you’d be wrong, because unfortunately I’m not in the midst of a good Cinderella-type tale, with romance, makeovers and awesome frocks (have you seen the rude Tinderella version? Very funny.) No, I get taken straight to the story with the most annoying of annoying characters around – Goldilocks and the 3 bears. With eyes shut, my dinner companions all suddenly morph into Goldilockses, all criticism and complaints about the meal before them. But every now and then a recipe comes along that has my entire family gushing with praise, declaring it, ‘Just right’. And thankfully, this is one of those recipes. It is a gorgeous bit of kitchen alchemy. My fairy godmother tip to you is to bake the kumura to give you a rich, sweet base. Serve this on rice for a more substantial meal. Allergy info: Vegan. Free from gluten, egg, dairy. Substitutions? : I think this recipe is pretty perfect as is. Prep ahead? : Kumura mash can store in the fridge for 2-3 days. Prepared patties can be refrigerated until it’s time to cook. Why I like it: Simple, vegie-packed, delicious. A perfect meat-free Monday recipe. Smuggling rating: 9/10 – vegies hidden in vegies, all fried up a bit crispy. 1/4 cup besan (chickpea flour) – for rolling. To get the kumura mash, chuck a whole kumura into your oven at 180C for 50-60 minutes until squishy. (Any leftovers are great added to spag bol, or mixed into sweet muffins). In a large bowl, mash the chickpeas and mix through the vegies and spices. Form golf ball size patties and dunk in the chickpea flour. Serve with salad, lemon & a dollop of Greek yoghurt. Yep, that’s right. It’s pretty complicated. I buy good stuff and I cook yummy things. I guess COOKING is the important word though, to me it seems like the logical key to good health. Dieters in different food camps get caught up in ingredient wars and fighting to prove that their system of eating is best, but for me that’s all a personal choice. What’s really important is that you’re taking responsibility for your ingredients and creating nourishing meals at home. 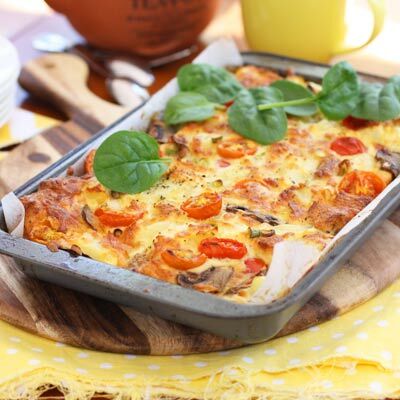 And it doesn’t have to be hard – here’s a great recipe for the whole family that uses one mixing bowl and one frying pan. Included on the ingredient list is besan flour. Also known as chickpea flour, you can find it in the larger supermarkets and health food stores. I don’t often make you seek out an ingredient, but I think this one is worth while since it’s tasty and nutritious and it just so happens that it’s also gluten-free. 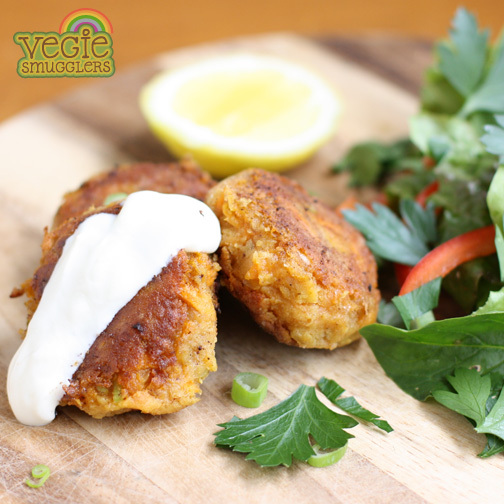 This recipe also happens to be vegetarian, since a bit of meat-free eating is good for the environment and it gives the little cutie creatures a night off from worry. 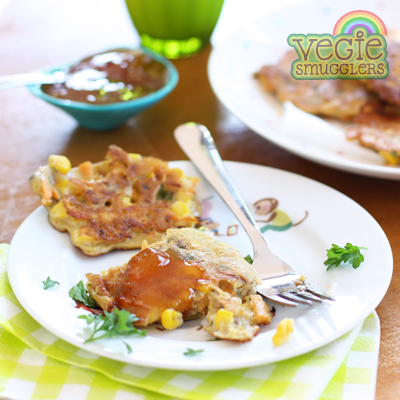 Toddlers might like to have a bit of mango chutney spread over their fritters, adults might like some fresh herbs and a chutney with a bit of punch, along with some salad. Great finger food for toddlers. Oil of your choice for frying. 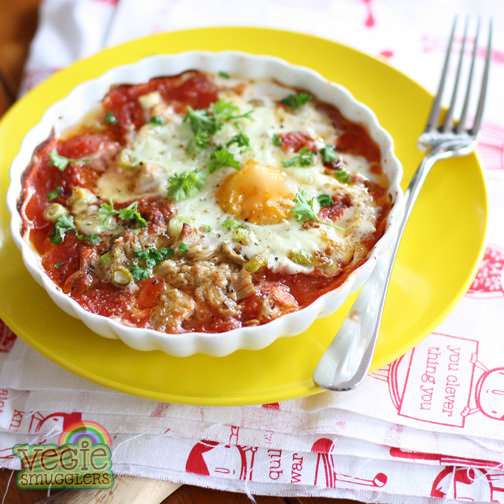 Use as much as you’re comfortable with – I like quite a lot for this recipe! Tip the flour and garam masala into a mixing bowl. Whisk together the eggs and milk then tip into the flour, whisking as you go to avoid lumps. Add in the carrot, onion, corn and herbs. Combine well. Heat a large frying pan over medium/low heat. Add the oil and when hot, use a 1/4 cup measure to dollop in some fritter mix. Once the edges set, you can gently spread the chunkier filling out so that it’s an even thickness. Cook for 3 minutes or so on each side until the onion is cooked through. Serve with chutney of your choice and some salad. Feeds 2 adults & 2 smaller kids, with a side of salad & pappodums. I’m thinking of launching a Vegie Smugglers fragrance. If it’s good enough for Kylie, then it’s good enough for me. The scent will be based on all my favourite smells – toasted coconut, topped up with freshly toasted flaked almonds. Round it off with freshly ground coffee, meringue and a touch of gin with lime and I’m shoving all my best wafts into one, saleable potion. I suppose the bottle will have to be lime green, and possibly shaped into an artistic impression of a zucchini. If I make it out of flexible plastic and add some batteries, I can offer mothers both a good smell and a happy day. But I’m having trouble with the name. I’m trawling all the celebrity scents to find inspiration. I could go atmospheric, like Antonio Banderas’s ‘Mediterraneo’, or try to entice you, like Cher’s ‘Uninhibited’ or Britney’s ‘Hidden Fantasy’ (excuse me while I vomit a little in my mouth). Or even onamatapeic like Katy Perry’s ‘Meow’. What do you think? Do you have any other enticing ingredients that need to be considered? Or good name suggestions? Possibly I’ll stick to simple. 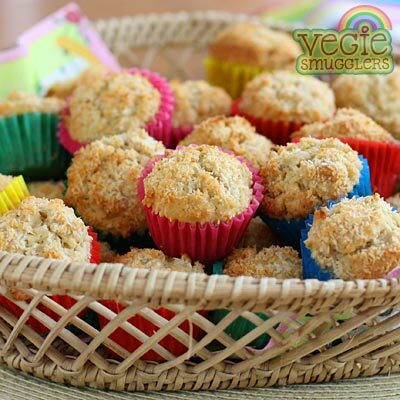 Maybe just ‘Delish’, just like these dairy-free coconut muffins. These are delicately flavoured treats that freeze really well – perfect for lunchboxes. After a couple of days they dry out a little but will revive after a quite zap in the microwave. Preheat the oven to 180C. Line mini-muffin trays with paper cases. In a large bowl, combine the flour (no need to sift), oats, coconut & brown sugar. Whisk together the eggs, oil and coconut milk in a separate bowl or jug. Pour the wet ingredients into the dry. Stir until just combined, then divide into your muffin cases until full (the mix doesn’t rise overly much). Sprinkle a thick layer of extra coconut over the top and bake for 13-15 minutes until golden and a skewer comes out clean. Wasn’t there a lot of pressure a while back to give up bread? I was still working in magazine-land at the time and naught a model nor stylist nor photographer would DARE have it pass their lips (but then joyously they discovered QUINOA and were saved from the evil rampaging of processed carbs). Me? I’ve always loved bread and have never had issues with it. A warm crusty baguette is pretty much as good as life gets. Sourdough downright seduces me and I find it IMPOSSIBLE to walk through Townhall station without grabbing a Luneburger loaf. In return, they’ve given me a bunch of prizes for my June giveaway. Up for grabs are two vouchers for $40 each and 5 kids merchandise packs which include a ruler, pencil case, pencils & lunch bag. To enter you must be in Australia and you must be a Vegie Smugglers subscriber. Check out the Bakers Delight website and then comment below about which of their products is your favourite and what you like to do with it (stay nice!). Cut a big round of bread from a slice, push it into a greased muffin tin, spray with oil and grill until a bit golden. 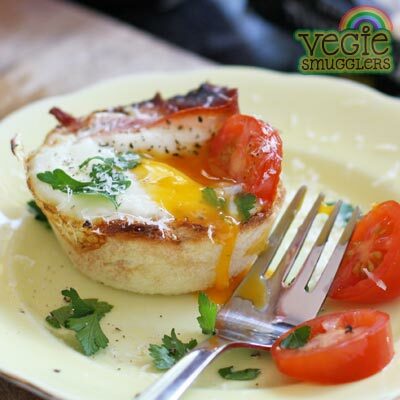 Then pop in some prosciutto and cherry tomato before cracking in an egg (in a smaller muffin hole, you won’t fit all the egg-white). Then bake until set to your liking and sprinkle over salt, pepper, parmesan and parsley. Entries close Sunday June 23 at 8pm, AEST. **COMP NOW CLOSED. CONGRATULATIONS TO VANESSA & JILL WHO WON THE VOUCHERS AND TO SUSIE, CAROLINE, DEB, JOANNE & ALLISON WHO WON THE MERCHANDISE PACKS. A couple of weeks ago I slipped on my wooden stairs and slammed down on my arse. It was a graceful, elegant move designed to demonstrate to the children exactly why we don’t run on the stairs in our socks. After a couple of visits to a lovely (medically trained) young man with strong hands I’m now feeling alot better and am knowledgeable about C8, T3 and S4. After giving myself a fair whack, I have several ongoing symptoms, one of which is chronic GRUMPINESS, no doubt helped along by continued cold weather and the fact we’ve not had a decent holiday since this trip, which I sadly see is nearly two years ago. How are you other Southern Hemisphere folks all travelling? Over it? What measures do you put in place to survive winter? I like to think that I combine a noble combination of exercise, interesting projects and a Zen attitude about the ebb and flow of nature to get me through, but actually I just tend to eat more sugar, wear ridiculous amounts of clothing and whinge. A lot. I whinge about the cold. About how unfit I am. About how much my children whinge. About the consistent stream of people telling me I need to read Sarah Wilson’s “I quit sugar” in order to pick myself up a little. Don’t they understand that sugar is my winter lifeline? 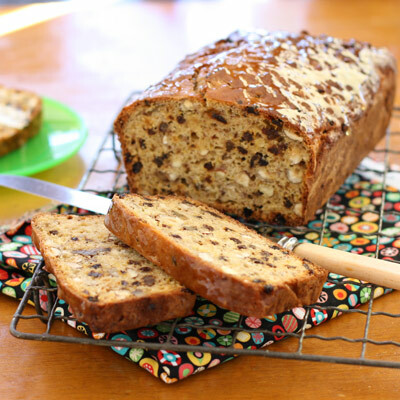 In defiance, here’s a cakey-bread loaf that I highly recommend for a little shot of food pleasure. As with most of my sweet stuff, there’s a silver lining of nutrition to ease your conscience and make that second piece seem more acceptable. It’s delicious straight from the oven, or do the classic banana bread thing, of toasting slices and spreading your sugar with lard. Preheat the oven to 180c. Grease and line a 14x20cm loaf tin. In a large bowl, mix together the cheese and sugar. Sift over the flour and baking powder. Pop the zest, nuts and currants on top and fold it all in together. Bake in the oven for an hour or an hour and 10, until the top bounces slightly and a skewer comes out clean. While warm brush the top with warmed honey.